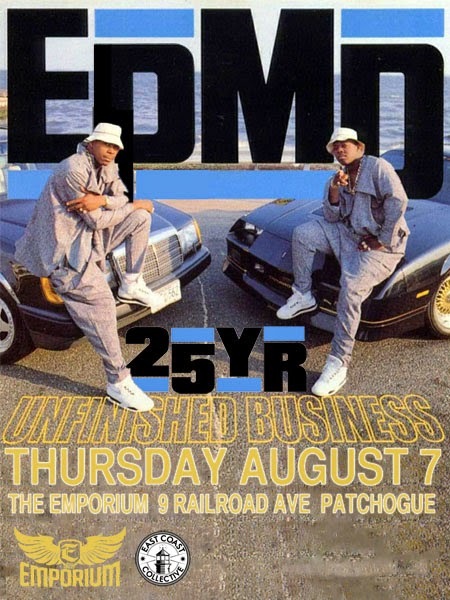 To celebrate the 25th anniversary of their sophomore album Unfinished Business, EPMD will be performing live at The Emporium in Patchogue, two weeks from today, on Thursday, August 7. Also on the bill are local acts Ancient Tongue, Status, DiE$eL-E, Contradiction, and Musick Medics. Doors open at 7, show starts at 8, tickets cost $20 in advance or $25 at the door and are available via ticketfly. You must be 18 or older to attend. Of course, if you're younger than 18 and want to attend an EPMD show, you should be allowed to do so on GP ... but don't bank on that getting you past security.